Isn't this a stunning arrangement? 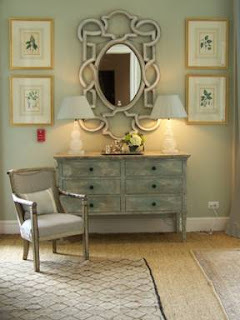 I love the combination of the unusual mirror, the painted gray chest, and the lamps. To my eye, the proportions of all of the items work beautifully together. Does anyone recognize the mirror? I have never seen anything like it. Very pretty vignette - Love the mirror too but have never seen it before! This is a truly grand arrangement. Classic, yet with an antique feel. I love that mirror! It's quite a statement piece. Thank you for posting this, such a beautiful room. I have never seen a mirror like that..it is very beautiful! Really lovely - amazing mirror. Funny small world story for you. I am an antique dealer here in Atlanta. A couple of years ago I bought a pair of chairs in Sweden that I really loved. They sold very quickly and I regretted that I had not taken a picture of them. I was talking to someone at the Stalls about those chairs yesterday and he said that X bought the chairs. X happens to be the owner of the Peachtree Battle house that you posted. I went back to the post and, sure enough, there were my chairs. I remember thinking that they looked famailiar when I initially read the post. I now have a picture of my chairs. Thanks so much! I'd love to find another pair. Gigi, thanks for sharing that story! I am going to look at that post. Small world! I wonder if that Peachtree Battle House has sold yet. I will check on that too. Lovely mirror...but love the serenity of the subdued colors. I love the chest and mirror - beautiful!! Wonderful mirror. I love the proportion of the items and the arrangement. That mirror is simply swirly! Edward and I are happy you visited us and led us here to your beautiful site. We shall return! I love the finish on the chest!! I love painted furniture! very savvy. i love it. sometimes the most unusual elements make the most savvy style and statement. Wow, that is really something! It really makes a pleasing statement with that chest! Ooh I love the symmetry of this arrangement and the mirror is stunning!